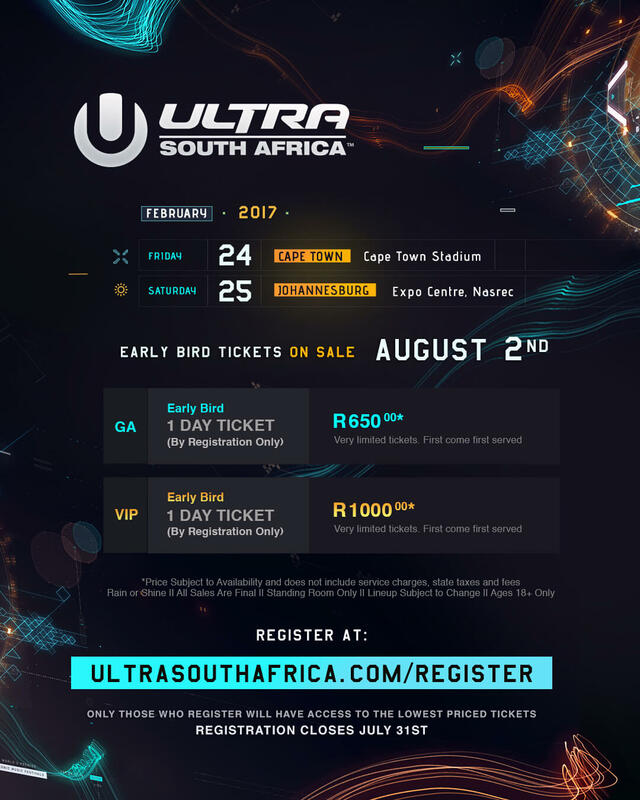 ULTRA SOUTH AFRICA proudly announces its return with the 2017 festival dates, a brand new venue for Cape Town, and for those that are quick on the draw, a limited number of early bird tickets that will be available at the lowest prices guaranteed. As South Africa’s biggest electronic music festival, ULTRA South Africa has built a name that, like the global brand, is synonymous with the world best DJs, and the hottest destination venues, coupled with the most advanced sound and lighting production SA has ever seen. ULTRA South Africa has continued to raise the festival bar year on year, and 2017 will be no different. Five months after the 2016 shows, it can finally be revealed that Africa’s largest electronic music festival will be held for the first time in 2017 at the iconic and world-renowned CAPE TOWN STADIUM, Green Point on Friday, February 24. This venue, the landmark of the Mother City, will create an entirely new ULTRA experience for Capetonian electronic music lovers, ensuring that loyal patrons will experience something entirely unique, while new Ultranauts will have a completely unforgettable festival experience. The Johannesburg event will remain at its lifelong home, the NASREC EXPO CENTRE on Saturday, February 25, offering the same earth-shaking music experience that it has every year. Early bird registration opened to an overwhelming response on 20th July, and early bird tickets go on sale (for those that registered) on Tuesday 2nd August on a first come, first served basis. Please note that this will be the best ticket price for ULTRA South Africa 2017; see all three tiers of ticket prices below. Prices do not include booking fees.